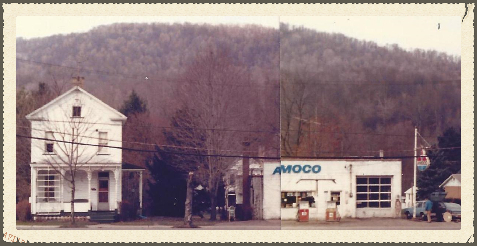 Simpson's Amoco Garage was a symbol in Bolivar for many years. The photo was taken in the early 1970's. This service station was one of 5 service stations the town used to have in the earlier days of Bolivar's growth. "Simmy" Simpson would be sitting in his large arm chair in the garage having a conversation with the many town people who were willing to congregate and enjoy the homemade ice cream sandwiches. He never turned a child or adult away from having a good time with a simple conversation. In the mid Sixties Simmi had a hugh storage building out back of his garage. He had just fixed the furnace for the evening and was getting ready for bed when his wife informed him that his garage was on fire. That was the largest fire in town in years when he lost his storage garage and all its contents, however the garage itself was still untouched. The building and home next door to the garage were sold in 1991 to Luck Garland who operated the garage for several years. The Garage was later sold to the Bolivar Volunteer Fire Company. The Fire Company agreed to let the Borough use the garage for storing the Police Cruiser for several years before the Fire Company demolished the Garage in August of 2013 for use as a parking lot for the new fire hall. Although the garage is now gone the house beside it is still standing and privately owned.